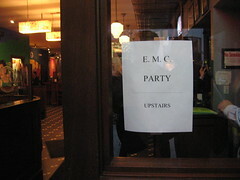 EMC hosted about 100 bloggers last night at the Rattlesnake in Back Bay (Boston). It was great to meet people from the community in person, like Constantine von Hoffman, John Eckman, Scott Monty, Steve Garfield, Doc Searls, Dan Schawbel, Julia Roy, Chris Brogan, Amanda Mooney, and Ann Handley. Looking forward to seeing you at PodCamp Boston next week!